Mercedes Benz is a German manufacturer of luxury brand automobiles. Mercedes has brought many innovations, safety features and performance to their models. The Mercedes Benz convertible top models are included in the Mercedes C-class Mercedes SL-class and Mercedes S-class. Each of our Mercedes Benz convertible tops is manufactured to original pattern specifications and we offer the original fabric selection. 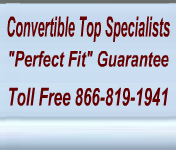 Our Mercedes Benz convertible tops will instantly renew your vehicle to show room condition. Our replacement Mercedes Benz convertible tops are available for the Mercedes Benz C-class convertibles and Mercedes Benz S-Class convertible.